CPAP masks cover the full face or parts of the face while nasal pillows sit just underneath the nose and create a seal at the base of the nostrils. There are pros and cons to each mask option, and everyone has their own preference. According to CPAP.com, out of the two basic designs for mask options, one mask covers the nose and mouth or full face, and one covers over just the nose area. These types of masks often have a "four-point headgear" system. The full face mask is good for people who breathe through their mouth at night. This is good for people who have ongoing sinus issues and breathing through the nose is a problem. A chin strap option is available for people who are physically able to breathe through their nose at night and use the nose mask. The chin strap helps keep the mouth closed. Nasal pillows sit underneath the nose and the device sits at the opening of the nostrils. This is a "maskless" option because nasal pillows do not cover any part of the face. There are some nasal pillow systems come with headgear to hold the nasal pillow in place. One nasal pillow option has a mouthpiece to hold the nasals pillows in place. There are even some hybrid masks that use both a mask that cover the mouth in addition to the nasal pillows. While there are many different types, CPAP masks have typical pros and cons. 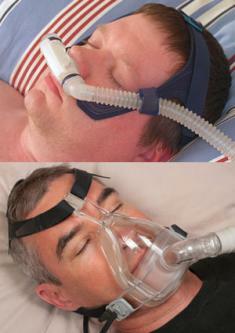 Some people like their CPAP masks because they have tried other face masks and have not had success in using them. People express that their face mask produces a good seal and is more comfortable to sleep with. People who dislike the masks and prefer nasal pillows feel too encumbered by face masks and do not like the feeling of the mask on their face. They also do not like being restricted throughout the night from eating or drinking, or being able to blow their nose. People have expressed likes and dislikes about the nasal pillows as well. Some people prefer the nasal pillows over face masks. They love the freedom nasal pillows provide from the encumbering masks and prefer the seal it creates within the nostrils. They also like the fact that you can take the pillows and rotate them until you get a good seal. Also, for men with beards and mustaches, nasal pillows might seal better than the face mask. Nasal pillows are known to have some potential drawbacks. While some people do prefer the nasal pillows, some are afraid that they will cause the nostrils to widen with nightly use and cited this as a reason to either minimize use or to use just a face mask. No one mask is right for everyone. It is best to be fitted for a mask to make certain the mask will create a seal and be right for your personal physical attributes. You want to make sure the mask fits right and you can maintain a good seal. Patience is the key in working with your CPAP machine and finding the CPAP mask that suits you best.